Psychogeography, the practice of creating new visions of the urban environment through mindful walking, is everywhere these days. Pick up a comic book for instance – The League of Extraordinary Gentlemen, Century: 1910 – and there, alongside A. J. Raffles, Orlando, MacHeath and Ishmael, is Iain Sinclair, ‘the country’s leading proponent of “psychogeography”‘, in the guise of Andrew Norton, a character from his novel Slow Chocolate Autopsy – baffling Mina Harker and Alan Quartermain with chat of Kings Cross as a ‘myth sump’, the 07/07 bomb, and the films of Patrick Keiller. It will be a short hop from this to Batman teaming up with Will Self, or Captain Britain encountering John Davies on the M62. ‘Find the miraculous’ sounds like a good thing to do – so how to get started? Where’s the guidebook to ‘revelatory moments’? If, like me, you find an instruction manual a useful adjunct to any human endeavor, you could do worse than A mis-GUIDE to ANYWHERE, published by artist-researchers Wrights & Sites. All good stuff and I recommend it, but maybe – like Raffles the gentleman thief picking a lock with his tie-pin – you can use simple tools already at hand. For instance, The Manchester Zedders use the squares of the A-Z as sites as a starting point for exploration, finding dangerous buttercups, smiling subways, and lots more besides. Meanwhile in a part of the North West far far away, in Round the Merseyrail We Go the Merseytravel map is used as the springboard for an exploration of the ways public transport interacts with the places it serves and the personal experience of the author/traveller. Personally, as part of plotting my autobiogeographical route, I sometimes acquire old travel books and try to use them in the present. Last week (the first of our annual Scottish holiday) I picked up About Britain No. 5: Chilterns to Black Country in the secondhand bookshop on Pitlochry station. I was struck by the coincidence of coming hundreds of miles northwards and finding a book containing my recent southerly journey, Warmington Village rendered into an endpaper idyll and a tiny Banbury inked into a motoring tour. and making statements such as ‘If [the country] contains Durham cathedral, it contains coal mines, iron foundries, and the newest of factories’. However the celebration of the parts of the Midlands I know best is somewhat equivocal. There is a dark cloud over Birmingham and the Black Country, ‘as if it were on another planet inhabited by prisoners or madmen’. The ugliness of the Potteries is ‘so demonic that it is fascinating’. However, ‘the girls contrive to look as fresh and bright as new paint’ owing to the beneficial effects of – you’ll never guess – the ‘gigantic cinemas’, which ‘have replaced the Victorian chapels and churches as the quickest way out of ugliness and dirt’. I love the almost science-fictional idea that trips to the pictures inspired people not to ‘fall back in despair into the dirt and debris of the last 200 years’ and even shaped what they looked like. It reminds me of a story in Jimmy Olsen, Superman’s Pal (142-143, 1971) in which the inhabitants of a miniature experimental world evolve to mimic characters from the horror movies continually projected on their skies – when it gets out of hand Superman saves the day by switching reels to Oklahoma!. Coming back to the search for a psychogeography guidebook, why not simply get the daddy of them all: I-Spy in the Town? In case this cheery little volume doesn’t sound intellectual/artistic/political enough, let me point out that it dabbles in semiotics (‘Whenever you go to town, one thing you will notice (no pun intended!) is that there are signs everywhere, pointing things out, telling you what to do, warning you, and so on’), makes obliquely apocalyptic posthuman prophecies (‘The end of the pedestrian area. I-Spy for 10’) and hints at the sociopolitical forces that drive urban evolution (‘Old industrial buildings…may take on a a new lease of life as housing.’) As my 1992 copy is from the latter days of I-Spy books when Michelin was publishing them, the Michelin Man presides over its pages like a genial imp, gesturing proprietorially at a high street, throwing up his hands in delight at ‘Service Area – reversing only’ sign (I-Spy for 15) and reminding us to get parental permission before sending for a badge. This is probably being unfair to an innocent black and white drawing. But I have never seen the Michelin Man in the same way since reading William Gibson’s Pattern Recognition while on holiday last year. 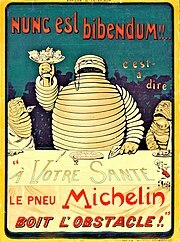 In it, the heroine Cayce whose ‘pathological sensitivity to brands makes her the perfect divining rod for an agency that wants to test a new logo’, is literally allergic to the image of the Michelin Man, becoming ill when shown a picture of him ‘in one of his earliest, most stomach-churningly creepy manifestations, not the inflated-maggot de-shelled Ninja Turtle of the present day, but that weird, jaded, cigar-smoking elder creature suggesting a mummy with elephantiasis’. Cue vague memories of studying this at art school – the original version had a name, Bibendum, first seen toasting avatars of the weaker tyre brands with a toast about ‘drinking up obstacles’ – driving as a kind of sick triumphal hedonism, which is why I prefer to walk when possible. I am writing this in a self-catering cottage in Glentrool Village, a hamlet that Richard Hannay, sometime adventurer in these parts might call a ‘one-horse dorp’ – simply a quiet collection of new houses on the edge of the vast Galloway Forest. (Come to think of it, in the Wold-Newton family tree, Hannay is a blood relative of the aforementioned Allan Quartermain and Raffles – everything connects.) Despite all the stuff I’ve been reading, options for dreaming and playfully remaking the city or drifting into unexplored urban zones are limited here as there’s only one street. An A-Z of Glentrool would not need much of the alphabet; even ‘A’ and ‘Z’ would be redundant, as the one street doesn’t seem to need a name. But perhaps I’m just not getting it… maybe a hamlet can be as rich as a city if you look hard enough; maybe a psychogeography of forests and mountains awaits discovery. ”You can find ‘anywhere’ any where’ say Wrights & Sites; ‘Keep your I-Spy eyes open’ says creepy Bibendum; ‘Follow this way and that, as the freak takes you’ says Robert Louis Stevenson. OK then. The shelves of this house contain mainly cookbooks, but among them is a volume of sermons from 1901: Neglected People of the Bible by Dinsdale T. Young. There’s a bookmark, presumably left by a previous tenant, on page 129: ‘Gehazi was familiar with sacred things, yet a stranger to their power’. Gehazi, who I have indeed ‘neglected’ to the point of never having heard of him, lets the side down by being ‘unholy amid holiness, a vile transgressor’ somewhere in 2 Kings. Rev Dinsdale presents him as a warning: ‘O young man and maiden, take heed lest you turn your genius in an evil direction’; Gehazi ends up ‘a leper white as snow’. Living amongst the miraculous but only seeing the mundane would be a kind of falling-short, such as might invoke punitive leprosies, ‘the alienation, boredom and consumerism’ of inauthenticity, a Beggar’s Opera reconditioned as muzak, MacHeath with a tinsel knife – in the Festival future we now inhabit, the cinemas have become so gigantic that their edges cannot be seen by the naked eye, and dwelling within their unseen image-horizons threatens to make anyone into ‘prisoners or madmen’. Time to get some boots on and go out into the woods…no instruction manual needed.